Our courses are approved with the New Mexico Regulation & Licensing Department to meet all of your continuing education needs. Take the continuing education to renew your NM plumbers license today. All of our courses can be completed At Your Pace Online to help you meet the state's requirements to maintain your license. Once you finish your class you will have an official certificate of completion to save for your records, and we will report your course completion to the state for you. Our New Mexican Plumbing continuing education courses are done At Your Own Pace. 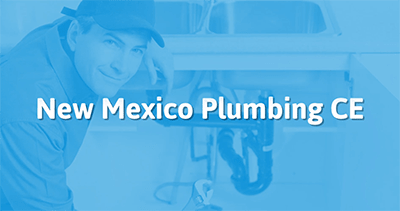 This 8 hour class on Industry Related topics for New Mexican Plumbers covers multiple aspects of running a successful and safe plumbing business. It will meet the 8 hours of Industry Related Topics needed by all licensees in the state. This class provides eight hours of content on topics central to the plumbing trades. It begins with a comprehensive course of study on all aspects of residential and commercial sanitary drainage systems, followed by a survey of the most recent developments in grease interceptors. This is followed with a survey in the principles and specific applications of Rainwater Harvesting in Alaska. The final part of the class covers two related topics, both experiencing rapid changes POWTS (Private Onsite Water Treatment Systems) and systems that reuse graywater. The class is designed to fulfill the eight hours of course content on industry-related topics that, along with a mandatory 8-hours on code changes to the 2015 NMPC, fulfills the entire 16-hour continuing education requirement for license renewal. This class provides eight hours of required continuing education on code changes required to renew a journeyman plumber or plumbing contractor's license. It begins with a focus on all amendments made by the Mechanical and Plumbing Bureau when adopting the 2015 UPC for the state, followed by an in-depth survey of the significant changes made to the model 2015 Uniform Plumbing Code, on which the 2015 NMPC is based, and ends with a brief look at a few critical codes for plumbers from the 2017 National Electrical Code.